The vintage and estate jewelry collection of lavalieres, necklaces, rings, bracelets, earrings, vanities and costume jewelry from the 1920's to 1970's, Featuring vintage sterling silver, 10k & 14k gold, platinum jewelry, crystal beads, Czech, and vintage collectible costume jewelry, men's accessories, watches and vintage vanities. You will also find period items from the Edwardian, Art Deco & Art Nouveau era. 61 Items. Showing Items 1 thru 15. 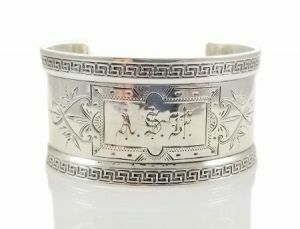 Wood & Hughes 1880's sterling silver Greek Key edged hand engraved napkin ring cuff bracelet with the initials ASF. 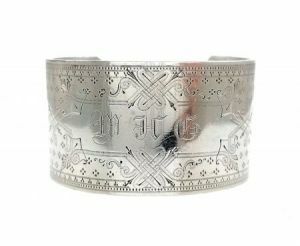 A mid 1800's coin silver hand engraved cuff bracelet with the initials MHG. Can be reshaped to fit any size wrist. 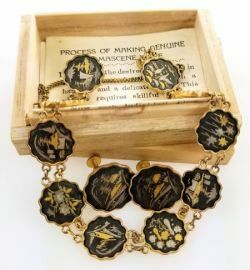 Vintage 24k gold plate damascene panel link bracelet and matching screw back earrings. The original box with the maker Amita Damascene Manufacturing Company noted along with the manufacturing process. 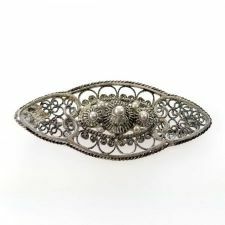 An antique late 1800's to turn of the century silver rosette filigree brooch. It is unmarked but tests at least 800 silver. 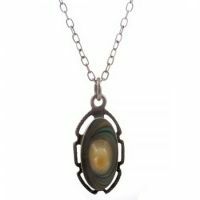 An Art Nouveau iridescent abalone blister pearl pendant in sterling silver from the early 1910's. Presented on a 20" sterling fine cable link chain. 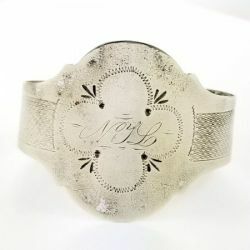 A mid 1800's coin silver hand engraved cuff bracelet with the initials NYL. Can be reshaped to fit any size wrist. 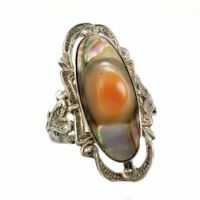 A lovely Art Nouveau filigree abalone blister pearl ring from the early 1910's with a fancy frame. A very sweet vintage hand made sterling silver pinky ring. 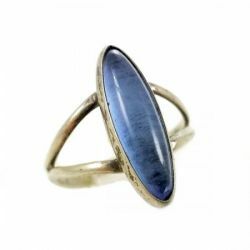 Featuring a navette shaped blue glass cabochon in a bezel setting on a split shank ring. 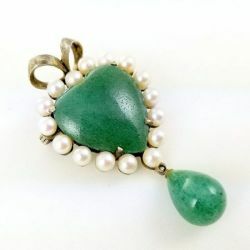 Vintage vermeil green adventurine heart surround by cultured pearls brooch which can also be worn as a pendant. Circa 1930's. 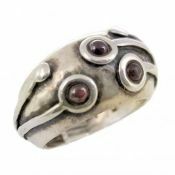 A vintage artisan made modernist design garnet ring in sterling silver. Having 3 cabochon garnets in a wide 12mm domed band. 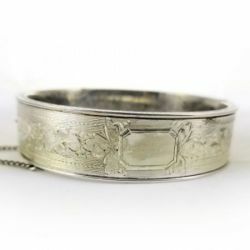 Vintage sterling silver engraved floral pattern 5/8" wide hinged bangle bracelet. Marked Dunn Bros Sterling. 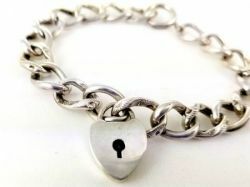 An antique early 1900's sterling silver patterned curb link bracelet with padlock charm. Marked HFB & Co in North Attleboro MA. 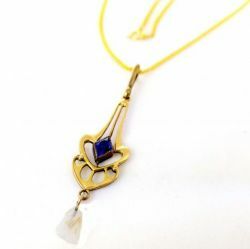 An early 1900's Art Nouveau 10k yellow gold lavaliere with an imitation sapphire and glass river pearl dangle. Presented on a 17 1/2" 14k gold filled chain. An early 1900's 10k yellow gold seed pearl, sapphire blue colored doublets and a Mississippi River Pear dangle. Presented on an 18" gold filled chain. 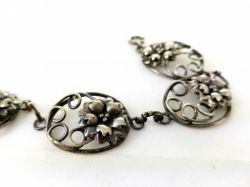 A vintage 1940's sterling silver handmade floral link bracelet marked sterling.